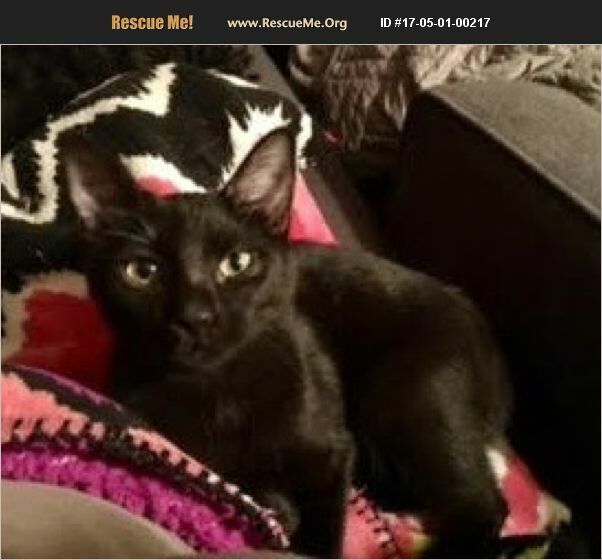 My name is Mocha, and I am a beautiful, affectionate, talkative black smoke Bombay/ DSH girl who was born in November 2016. I have the Bombay mix's soft, sleek, and gleaming coat that is like black patent leather as well as dreamy round copper-penny eyes. I love to cuddle with my foster meowmy, which is not surprising since Bombay mixes are sometimes called Velcro kitties because we are so sociable and like people so much. I love snuggling at night while my foster meowmy watches TV, and I find her lap a terrific venue for 'making biscuits.' I admit that I was a little scared and shy when I first arrived at my foster home. It took me a while to settle in and feel safe, but now that I know that I can trust her, I am very sweet and affectionate with my foster meowmy. By the same token, the person who adopts me needs to give me plenty of TLC and be patient with me until I can trust him/ her. You know, it's amazing the fruits of a little love and the passage of time! After I overcome my initial shyness and trepidation in my new home, it will be worth it when this little lap kitty cuddles with my new adopter. My new human companion will be thrilled when I carry on a feline conversation and make biscuits on his/ her lap! Are you that special someone who will accept the challenge and will understand what potential I have? You will be amazed when the time comes that I show you all of the love that I have to give. Please don't be superstitious of black cats! Buster's Friends makes a concerted effort to rescue black cats and kittens from shelters because they are five times more likely to be euthanized than any other color of cat. However, many people who have had a black or Bombay mix cat before end up adopting another one because they seem to have such wonderful personalities and are emotionally stable and well balanced. To find out more about Bombay mixes, watch the attached 2-3 minute You Tube video that appeared on Animal Planet or Google 'Cats 101 Bombay.' Mocha is updated on shots, spayed, dewormed, microchipped, FIV/ FeLV negative, and ready for her indoor-only home. No de-clawing permitted. Her adoption fee is $125 for kittens 9 months old and younger, cash or check payable to Buster's Friends. Please click the contact button if you are interested in Mocha, and we can let you know exactly where you can meet her. To make the process more efficient, download the adoption application at http://www.bustersfriends.org/catadoptionapplication.shtml. First save and then open it; then you can print it and fill it out.